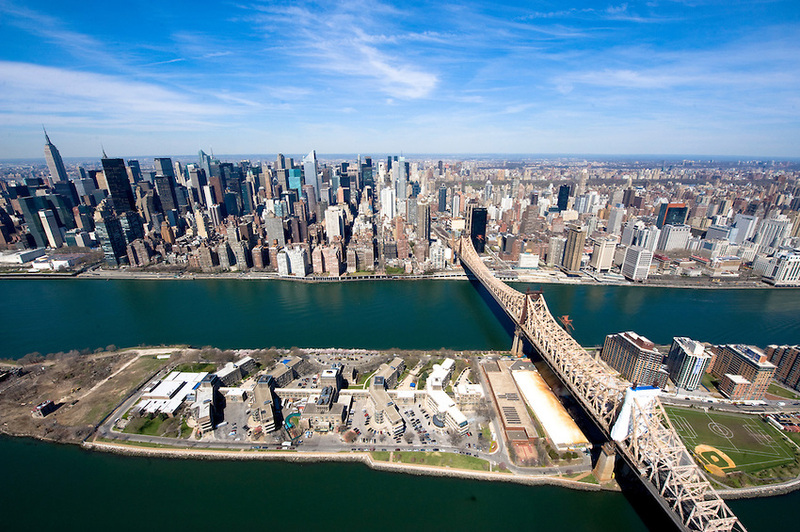 The Queensboro Bridge which connects the neighborhood of Long Island City with Manhattan, passing over Roosevelt Island, opened on March 30th 1909 and was the world’s first double decker bridge. The construction of this bridge began in 1903, but took until 1909 to complete due to a large section of the bridge falling off in a wind storm and labor unrest (including an attempt to dynamite one span). The bridge opened in 1909, having cost the public $18 million and 50 lives. 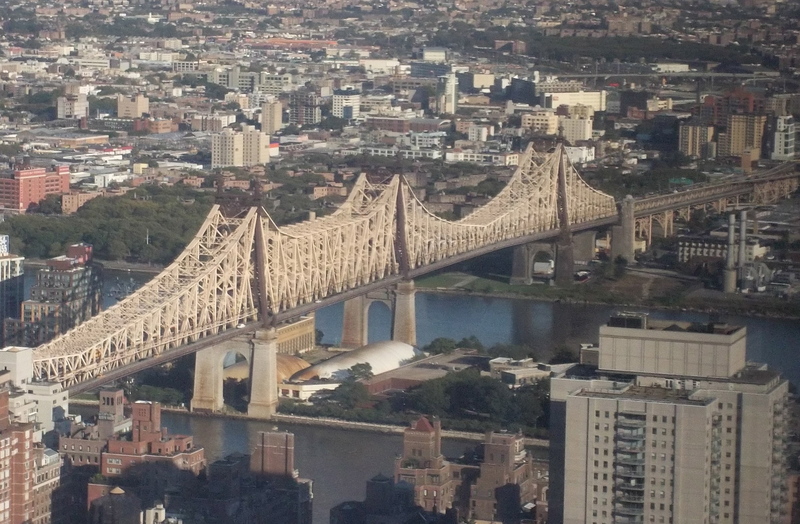 The bridge underwent a $300 million renovation that lasted from 1987 to 2012 and was subsequently renamed the “Ed Koch Queensboro Bridge” in honor of the previous mayor. 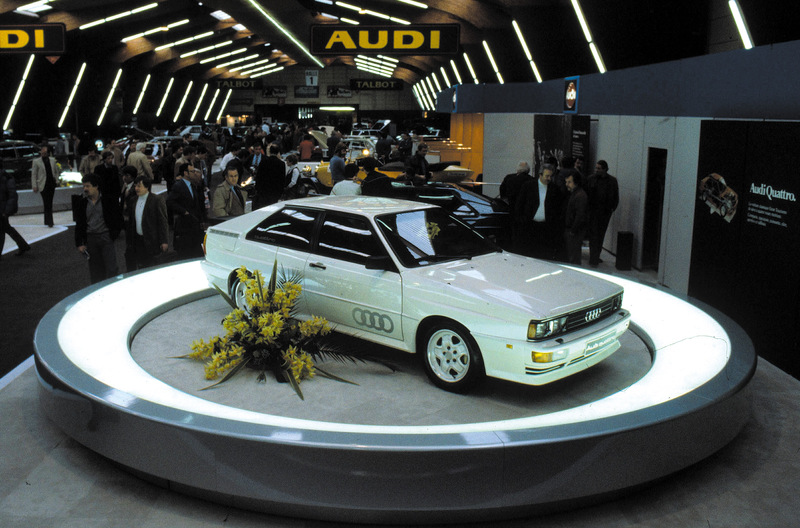 Audi’s legendary Quattro model was introduced at the Geneva Auto Show on March 29th 1980. This model was sold in Europe only until the 1983 model year when it was brought to the U.S. The original body introduced in the U.S. was pretty much unchanged from the European version and ran here from 1983 to 1986. Total U.S. vehicle sales for this model was only 664 units, so they’re pretty rare here. The all wheel drive car market had only one player at that time in the U.S., the AMC Eagle was the first all wheel drive passenger car to reach mass production here. The AMC was never considered to be a great looking car, so I’m a little surprised that the Audi didn’t sell more units. The annual Spring Turkey Run in Daytona starts on Friday 3/27 and runs til 3pm on Sunday March 29th. 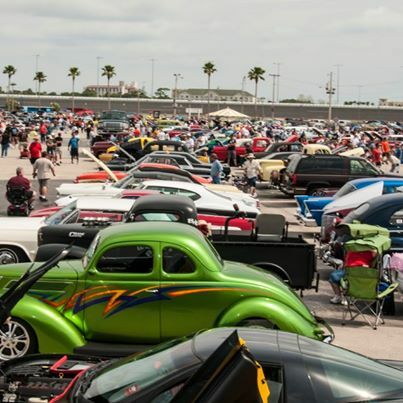 The car show, swap meet and cars for sale in the car corral will all be held all three days. Plus, if you register your classic car and bring it for the show, you’ll get to take it for a lap around the race track! But wait…that’s not all. Bring your camera and a sharpie with you on Saturday 3-28 between 4pm and 8pm because you’ll get to meet Daisy Duke. 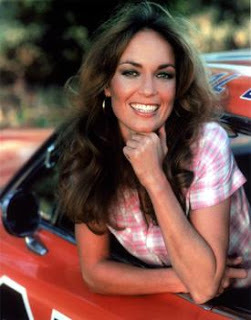 That’s right, Catherine Bach is going to be there…with the General Lee ! 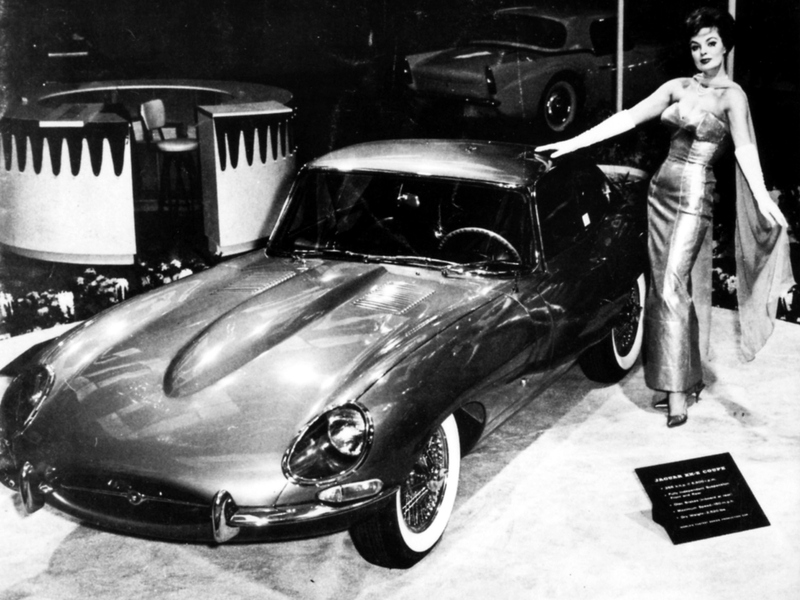 The Jaguar E-Type made its debut on March 21, 1961 at the Geneva Motor Show where the company proved to the world once again that they could build an incredible performance car with equally impressive appearance. Even Enzo Ferrari agreed, remarking that it was the best-looking car ever made. The Jaguar E-Type was intended as the next generation replacement to Jaguar’s Xk120-150 series of sports cars. The E-Type employed many lessons learned over the years, including those in the heat of competition with the D-Type sports racer. Power was from Jaguar’s 3.8-liter, straight six-cylinder engine which was first used in the XK150S the year before. 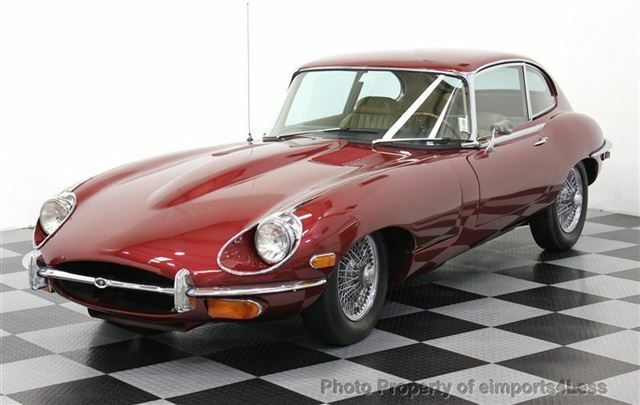 The engine was rated at 265 horsepower and gave the E-Type a top speed of 150 mph. The E-Type was equipped with modern independent rear suspension giving the car precise handling, grip, and comfort. Here’s a pic of one of my favorite cars that we’ve ever had at eimports: 1968 XKE Coupe. We found a new home for this little baby down in South Carolina where she’s enjoying the mild climate. Happy B-Day to the E Type ! Happy 66th Birthday to the Porsche 356 unveiling! The unit pictured above is one of 48 hand built ,all aluminum bodied, 356 coupes that were built in 1948 in Gmund, Austria. 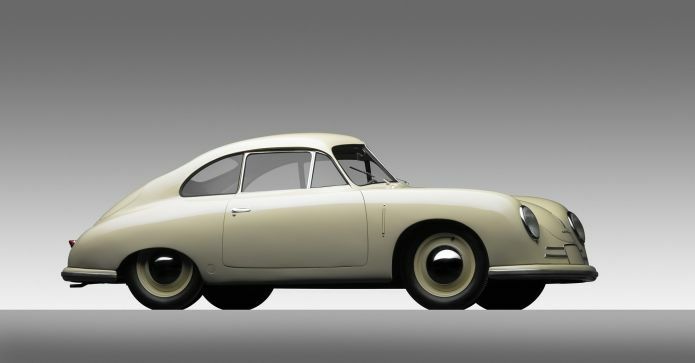 The final design work on the 356 was done by Erwin Komenda and these original aluminum bodied cars are now referred to as “Gmund models”. 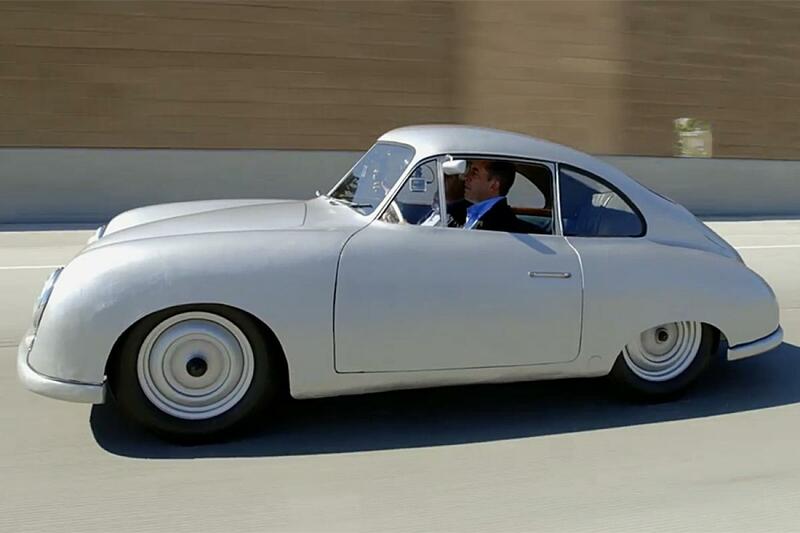 Here’s a neat pic of Jerry Sienfeld and Jay Leno cruising down the highway in Jerry’s Gmund model. The barn in Gmund where the first aluminum bodies were built quickly became insufficient to keep up with demand, so the production facility was moved to Zuffenhausen, a Stuttgart suburb. Porsche rented a facility there and space in the Ruetter bodywork factory. Ruetter took over the production of the 356 coupe bodies and another firm, Glaser, took over production of all cabriolet bodies. All bodies from this point forward were made of steel. the 356 C 1963 – 1965. September 1963 saw the introduction of the Porsche 356 successor on the Frankfurt auto show; the Porsche 901 (later to be known as Porsche 911). In October 1964 the Porsche 901 was renamed (re numbered) 911. Porsche was forced to do so because automobile manufacturer Peugeot owned the legal rights on three digit car numbers with the “0” in the middle. I just came across an article on cars.com about a neat study done in the U.K. concerning the possibility of “tagging” unsafe drivers or folks with previous violations to warn other drivers on the road that this particular car is known for doing crazy stuff on the road. It reminds me of some states that offer a reflective license plate for old folks who do not drive at night. If a police officer sees that vehicle out at night he can assume that the vehicle has been stolen or there may be an emergency. The U.K. poll was done by Flexed, a car leasing company, and showed that the vast majority of drivers (86 percent) favor placing the warning stickers on vehicles. It would be a sticker or sign similar to the Hazardous Chemical boards that warn other drivers of dangerous materials being transported by trucks. I can see the benefits of this idea, specifically for people who have been convicted of DUIs or possibly a driver who has been convicted of texting while driving multiple times. “Nobody should have to drive with the fear that the driver next to them is unpredictable or is a potential danger,” said Flexed spokesman Mark Hall in a statement. 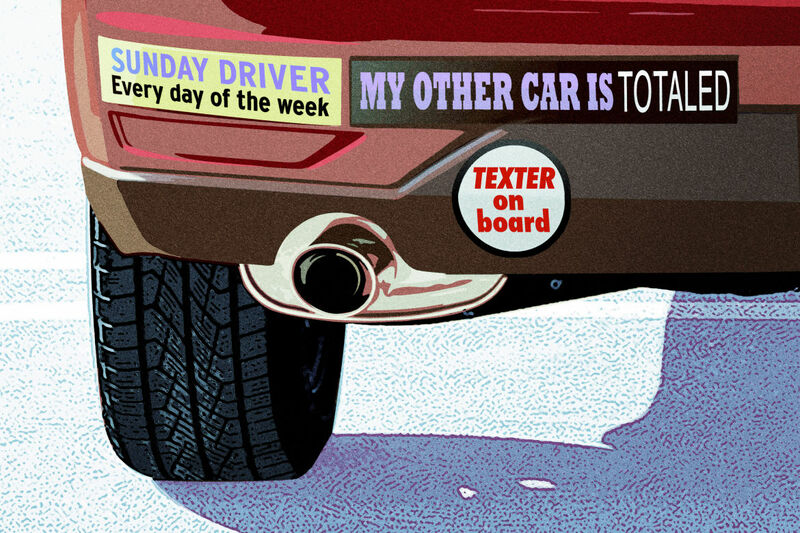 While these ideas may be a little off the cuff, the original concept of warning stickers is a unique one. Money magazine’s March issue had a few great tips to help you save time and money when shopping for your next car. #1: Call ahead and ask if the specific vehicle that you’re interested in is still available and there to be seen. Why this works? Car dealers will sometimes advertise “ghost cars”, cars that aren’t real and they’ll advertise them at unrealistic prices to get you to stop by the dealership. Call first to make sure that the specific vehicle is actually there and the price is right. This will save you a bunch of time and money because you’re not being sold something different once you get there and find out that the cheap car is not available. #2 Email ahead and get an exact price quote BEFORE you leave your house. Why do this? 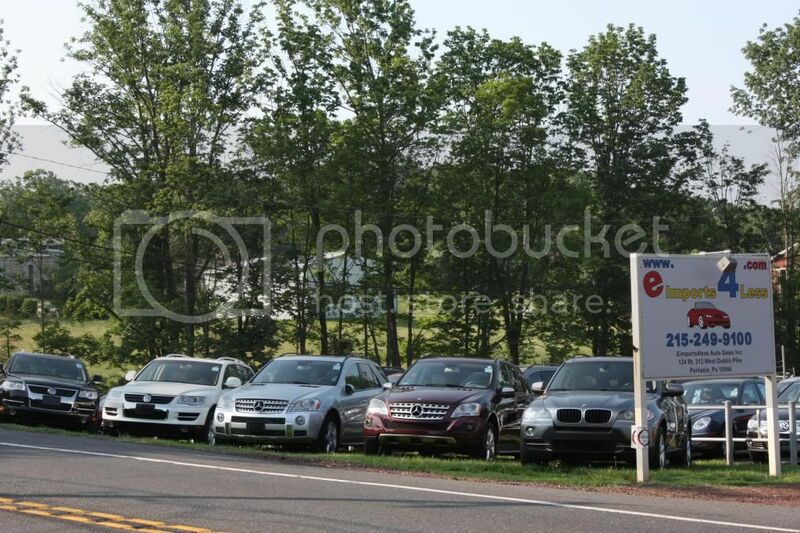 Car dealers sometimes advertise pricing that is far below the real price to entice people to come into the dealership and waste hours of their time with a professional salesperson. They give you the whole song and dance and waste half of your day and then when they put the actual contracts and real numbers in front of you, they are drastically different. The “real” numbers will then show you destination fees, dealer fees, detail fees, inspection fees, reconditioning fess, fees fees, etc. These dealers only show you these numbers AFTER they’ve wasted your day, ran your credit, got your bank approval, appraised your trade-in and had you clean it out, parked your trade-in out of sight, taken off your license plates and got you right where they want you. Then they give you the actual numbers and think that you won’t just walk away because you’ve already dedicated a full day to this dog and pony show and you definitely don’t want to go through this crap again. I can’t tell you how many of these stories that I’ve heard from previous customers of mine and I also can’t tell you how many times I’ve heard of people actually paying $2,000-$4,000 in “fees” on top of what they thought was the sale price. So… call or email ahead and ask for the exact sale price, including all fees, so that you may have your bank prepare a certified check. You’ll probably get the right figures at that point and save yourself many hours of time going to dealers who would rather play games then sell cars.